Inner Rambling of a Mid Life Mama. : This is Halloween, this is Halloween!!!! Today's post comes to you from unfamiliar territory, I am live from the bedroom of little Ash!!! Let me describe my surroundings.....we're sitting on a princess bed, off white iron molded into a kinda swirly four poster with little finials on the posts. Cute! The sheets and duvet are pink, yellow and purple with tiny flowers on the fabric with bigger flowers sewn on for decoration and ribbon embellishments.... sounds posh right? came form Wally World. There's a pile of clean clothes at the bottom of the bed that I couldn't be bothered to put away, Daisy is now curled up on the clean clothes... she's a shih tzu and doesn't shed so I don't care!!! My coffee is on the little white shelf next to the bed... the shelf has wooden hooks underneath and from them hang a Hello Kitty purse, a straw Cowgirl hat (Sheriff no less!) and a tiny yellow, hanger for dolls clothes. Next to the shelves is a GIANT window, covered with two inch faux wood blinds in white (custom made for the huge window and never pulled up cos they weigh more than me!!!). Outside it's a cold, wet miserable day, the rain is steadily falling without a hope of letting up before we have to go and ring the Salvation Army Bell outside the local Publix (British contingent: read Sainsbury's). A holiday tradition we adopted a couple of years ago and the girls love it!!!!! 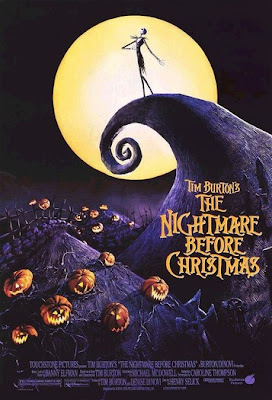 Back to my post and why I am coming to you from the room of and odd little five year old... another of our holiday traditions is to watch the Nightmare Before Christmas!!!! We ADORE this movie... watch it all year round but almost every weekend during the Holiday season. Forget A Wonderful Life and The Grinch we're all about Jack the Pumpkin King and Santy Claus. Tim Burton is a freakin' genius y'all. We also have James and Giant Peach which is just fabulous, this year we may add to the collection with the Corpse Bride and Coraline. If you haven't already discovered the magnificence that is Tim Burton you have been missing out!! Ash likes to share the excitement of the movie so she requested that I come into her room and blog from here while we watch the movie together. With so much inspiration how could I refuse!!!! Daddy's being a grinch, he's watching some truck show on Man TV and hogging the bigger screen.... it doesn't matter to us, Nightmare is great no matter where you watch it.... as long as you can cuddle and enjoy it with someone you love!!!! Guess she got up on the wrong side of the Princess bed!!! Go ahead, link to this post and let us know your favorite Christmas movie and how you like to watch it. I love the board on the door. I must get one for myself. I love that movie too and A Christmas Story. ha. love teh sign on the door...may have to borrow that idea. great movie too! hope you both have a great day! We all watched A Christmas Story last night. My hubby has always liked it. It is growing on me now. I guess I still love It's A Wonderful Life. And Elf. Love the door sign. I think I'll have to steal that idea too! Happy Sunday! love the mood board! i think i´ll have to steal this idea... hey i love the new look! hugs! p.s. favorite christmas movies? the holiday and love actually- we´re a bunch of romantics here. we LOVE Nightmare! In fact, it was my Ashley's fave movie FOREVER! I haven't seen Coraline yet, but I want to. sorry, i go for "It's a Wonderful Life!" And I actually CRY at Rudolph - how pathetic is that? A dog that doesn't shed - I WANT ONE!!! OK, I actually like Sleepless in Seattle as my christmas movie! So sue me lol! I love Sleepless in Seattle...awwww. I watched Julie and Julia tonight... verdict still out????? I'm a huge fan of the old school Grinch.